Use the form below (click button) to contact the Douglas-Hart Nature Center with your interest in a future Eagle Scout Project. 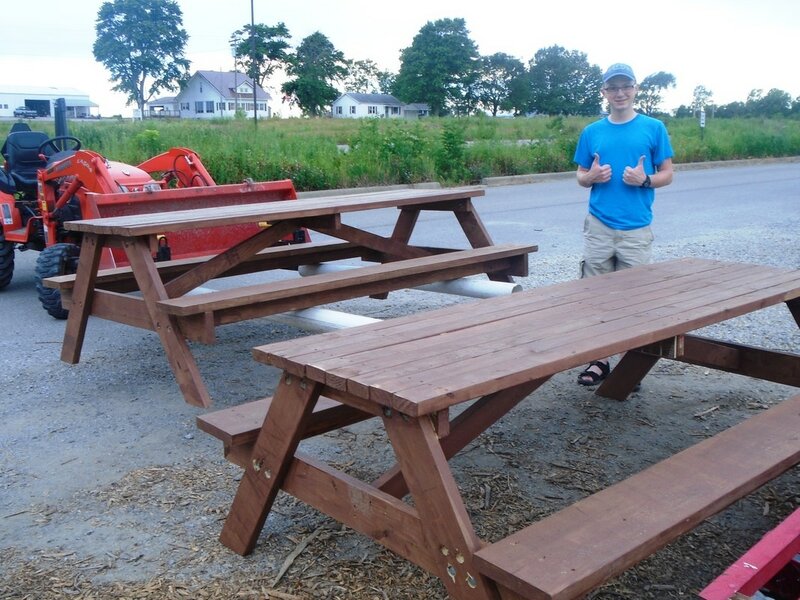 Isaac constructed, stained, and delivered two new solid-wood picnic tables for the Nature Center. These picnic tables allow large school groups to have seating for all the students during lunch time! Picnic tables are also used by camps and by visiting families. Ethan Bennett designed and constructed a footbridge to improve accessibility to the Douglas-Hart wetlands. He worked with his mentor and other scouts in his troop to construct a footbridge that would not only keep Kindergartners' feet dry, but would also also support a maintenance vehicle. 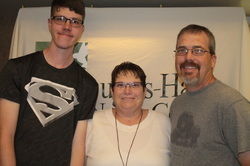 Ethan raised donations to fund the materials needed to construct the bridge, and donated $585 to support educational programs at Douglas-Hart Nature Center. Michael Black designed and constructed a kids' climbing fort in the Douglas-Hart "nature play area." He worked with staff to select a location, size, and materials that would compliment the existing play space. He recruited other scouts from his troop to assist with construction. Jacob Watson planned and led an improvements and additions to the Douglas-Hart educational garden. The project included adding new garden beds, stepping stones, planter blocks, and mulch. 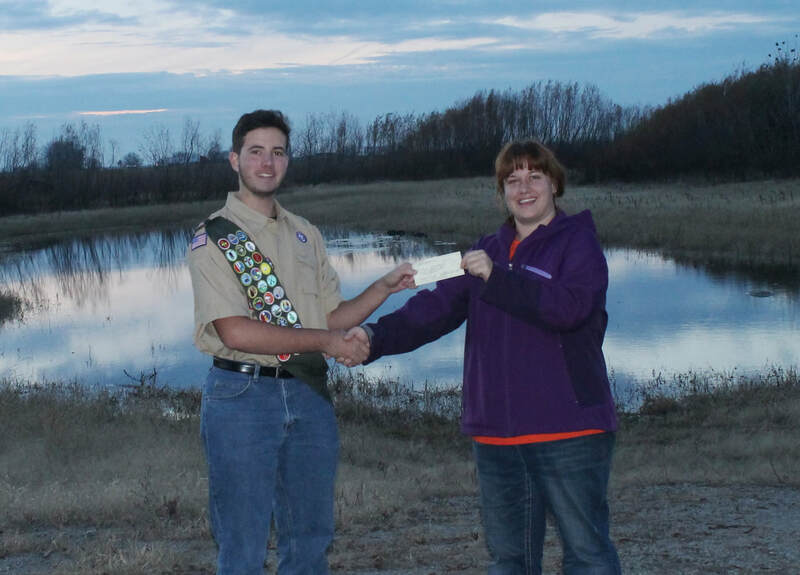 He raised funds for supplies and recruited other scouts in his troop to help carry out the project. Robert Rardin constructed and installed a pergola in the Douglas-Hart educational garden. His structure will provide shade to students, while supporting growing vines. Robert worked with his mentor to design the pergola, and recruited other scouts from his troop to help install it in the garden. Parker Whitaker designed and constructed an outdoor seed storage container to hold bird seed for the Douglas-Hart Nature Center. Parker worked with his mentor to complete construction using primarily salvaged materials, making it even more environmentally friendly. Dylan Littleton headed the restoration of a section of Douglas-Hart Nature Center woodlands. After recruiting a team of fellow scouts and families, Dylan led the effort to clear invasive species and to plant more beneficial native species in their place. Dylan's project improved the habitat for Illinois wildlife as well as Douglas-Hart visitors. Sam Stowell constructed eleven wooden bat boxes for the Douglas-Hart Nature Center woodlands. One bat box can house about 50 little brown bats, and a single bat can eat up to 3,000 mosqutoes each night! Sam's bat boxes are supported an excellent bat population at Douglas-Hart, and reducing mosquito bites for our visitors. Danny Hudson designed and constructed five "cold frame" boxes for the Douglas-Hart Nature Center conservation efforts. These boxes use old (recycled!) windows to create a mini-greenhouse effect. They allow our conservation team to begin the growing season in February & March when it would normally be too cold to start seedlings. Isaac Jackson designed and constructed work tables for the Douglas-Hart greenhouse. He recruited other scouts from his troop to help with construction and delivery of the tables. These surfaces are used throughout the year to prepare, maintanance, and store greenhouse supplies. Michael Johnson constructed benches for the Douglas-Hart Nature Center. 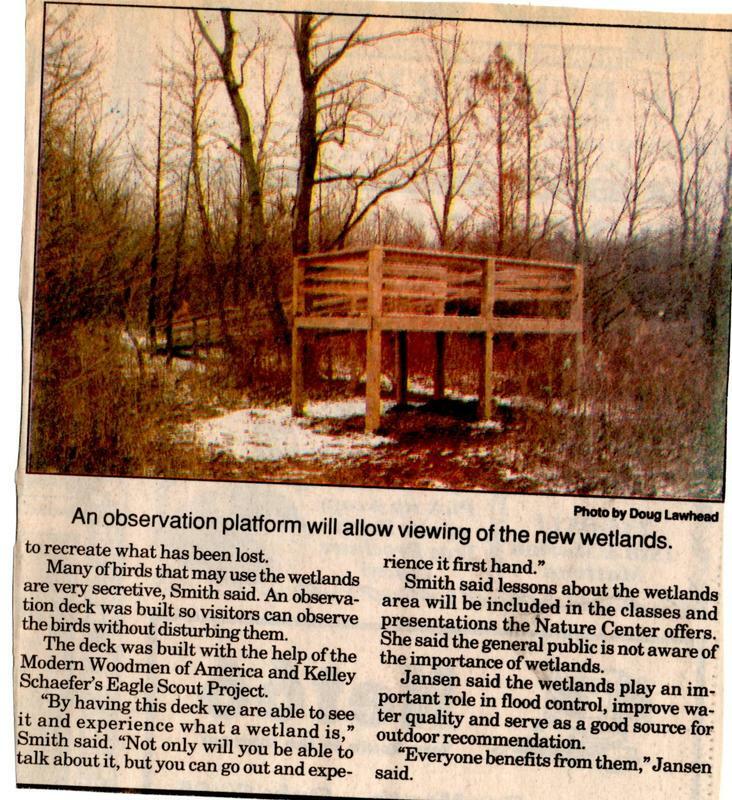 Kelley Schaefer worked with the help of Modern Woodsmen of America Camp 290 members to construct an overlook to the Douglas-Hart wetlands. The overlook is accessible by a long ramp, making it fully accessible. 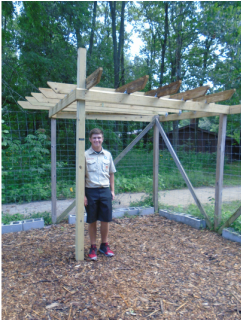 An Eagle Scout built two compost bins for use in the Douglas-Hart Nature Center educational garden. An Eagle Scout constructed four raised garden beds in the Douglas-Hart Nature Center educational garden. An Eagle Scout constructed several bird house & wildlife nesting boxes, and installed them as an educational display near the Douglas-Hart Nature Center trail head. 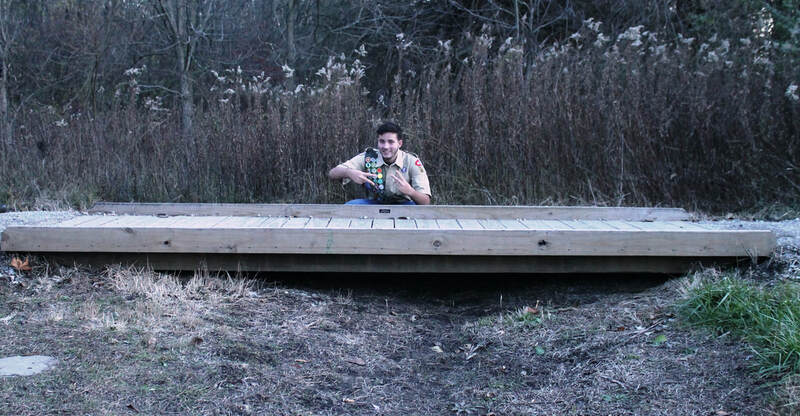 An Eagle Scout built a duck blind for wildlife observation by the Douglas-Hart Nature Center pond. 1,600 additional trees were planted at the Douglas-Hart Nature Center, by boy scouts. Do you know of an Eagle Scout project that was completed at Douglas-Hart but is not listed here? Please help us complete our records! Send information to volunteercoord@consolidated.net.